Responding to increased concerns about the health hazards of cumulative x-ray exposure, Nighttime Care Centers has employed the use of the Mini C-Arm throughout most of their five locations statewide, and this week are bringing this advanced technology to their Pasadena location. 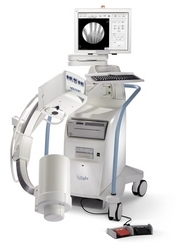 In the interest of improving patient care, Nighttime Care Centers have introduced the Mini C-arm as a radiological imaging tool for the evaluation of extremity injuries in the outpatient setting. The application of the C-arm in this setting offers patients, health care providers and insurers a safe and effective alternative to traditional x-ray. In the interest of improving patient care, Nighttime Care Centers have introduced the Mini C-arm as a radiological imaging tool for the evaluation of extremity injuries in the outpatient setting. The application of the C-arm in this setting offers patients, health care providers and insurers a safe and effective alternative to traditional x-ray. Responding to increased concerns about the health hazards of cumulative x-ray exposure, Nighttime Care Centers has employed the use of the Mini C-Arm throughout most of their five locations statewide, and this week are bringing this advanced technology to their Pasadena location. Dr. Robert Graw, Nighttime's Chief Executive Officer, says "We are proud to offer our patients the advantage of this cutting edge application of radiation technology, because it promotes less x-ray exposure, and allows for convenient treatment when patients want care." A mini c-arm's radiation exposure is estimated to be about 1/100th of a traditional x-ray. The c-arm can be used to x-ray arms, legs, wrists, ankles and other body parts. "Science is now telling us," remarks Dr. Graw, "that cumulative x-ray exposure from CT scans and other sources can be very harmful, so we always want to do what we can to minimize x-ray exposure for patients." The use of this digital technology in the urgent care setting allows Nighttime to help patients who can't get into the emergency room due to overcrowding, and can't get an appointment immediately with a private physician. Access to the emergency room or primary care physicians can be particularly limited on weekends and during the evening, when Nighttime Care Centers are always open. In addition to less radiation exposure, the mini c-arm is easy to administer and patient-friendly. "Families love the mini c-arm," says Dr. Graw "because it is faster and much less imposing than a traditional x-ray machine." The mini c-arm also allows patients to leave the Care Center with a printout. This copy can then be taken to a specialist or saved by the patient as part of their personal health record. "Simply put, patients want convenience and safety, and the mini c-arm offers both," states Dr. Graw. The addition of the C-arm technology represents Nighttime Care Centers' commitment to providing patients with the best medical care in an era where access to quality medical care is limited. Nighttime Care Centers, http://www.NightTime.com, are located throughout Maryland including Pasadena, Annapolis, Gambrills, Crofton, Columbia and Rockville with additional centers planned for Montgomery County, Northern Virginia and beyond. All are staffed by community physicians and offer same day appointments through their state of the art Call Center, so patients of all ages can choose a convenient time and location, 365 days a year. Nighttime Care Centers provide medical care for minor injuries and common illnesses, including the new C-Arm x-ray technology, and on-site laboratory and pharmaceutical services. A key distinction of Nighttime Care Centers' service is that Nighttime Care Centers do not provide primary medical care for patients, always honoring the patient's important relationship with the primary physician and continuity of care in a "medical home." Dating back to their beginnings in Anne Arundel County in 1989, Nighttime Care Centers have long been known for their unique style of care that combines the best of traditional medicine, delivered in a way that meets paitents' needs for convenient and timely medical care. Robert G. Graw, Jr., M.D. is a practicing pediatrician, hematologist and oncologist, and the Chief Executive Officer of Nighttime Care Centers. With over 35 years of practice experience, Dr. Graw promotes high quality, timely, patient-focused medical care. Dr. Graw is available for further comment and interviews. The new Nighttime Care Center logo.Nighttime Care Centers have long been known for their unique style of care that combines the best of traditional medicine, delivered in a way that meets paitents' needs for convenient and timely medical care. Robert G. Graw, Jr., M.D. is a practicing pediatrician, hematologist and oncologist, and the Chief Executive Officer of Nighttime Care Centers.With over 35 years of practice experience, Dr. Graw promotes high quality, timely, patient-focused medical care. Dr. Graw is available for further comment and interviews.